19) WOULD YOU LIKE FRIES WITH THAT? some personality assessment tools can cost thousands of dollars, but at Corcoran Coaching, we’ve opted for a much more affordable offering: a free DIsC assessment. Just visit www.corcorancoaching.com/behavioralstyle. php and you’ll be guided through a quick questionnaire to learn your own What is a style ‘personal Just likeothers com- as sistently dominant andbrand’? how to read well. (across all marketing platforms), pany or product branding, it’s built around a well-defined brand can elevate agent recimaging and messaging that is designed to ognition and help to establish credibility Yes, understanding people, listening to their needs and wants and responding create a feeling. And in the case of personal and authority. However, when executed appropriately all takehow work But because realare estate is a people branding, it influences you and wantattention. others incorrectly, the effects lackluster at best, business, it’syou. simply a must. the and better at itatyou become, to feel about From your photosAnd to other harmful worst. To help the you better avoid living as an or broker. brandyou’ll images,make elements andagent even content, theI promise. pitfalls of personal branding, we’ve there is a lot that goes into creating your compiled a list of what we feel are the 7 unique brand.to Displayed Best of luck you! correctly and con- deadliest sins. some personality assessment tools can cost thousands of dollars, but at Corcoran Coaching, we’veNO opted for a much more affordable offering: a free AUTHENTICITY DIsC assessment. Just visit www.corcorancoaching.com/behavioralstyle. Recognizable personal brands can be very You should be able to ‘breathe your brand’ php and you’ll be guided through a quick questionnaire to learn your own clever and memorable, but if your brand in everything that you do. This is importdominant andlast. how to read as well. isn’t ‘you’,style it won’t If you try toothers put ant not only for your customers, but perout a persona that is different from your haps most importantly for you. There is Yes, needs and wants responding ownunderstanding and the way you people, live yourlistening life, peo- to their a tremendous amount of and confidence that ple will take notice overwork time. and The attention. most comes knowing youisare who appropriately all take Butwith because realthat estate a people incredible it’s personal brands weaveAnd pro-theyou portray, that become, you have the business, simply a must. better at itandyou thehabits, better fessional and personal qualities into one. 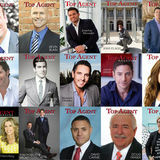 inspiration, knowledge and expertise to living you’ll make as an agent or broker. I promise. Your brand becomes an extension of you. back it up. 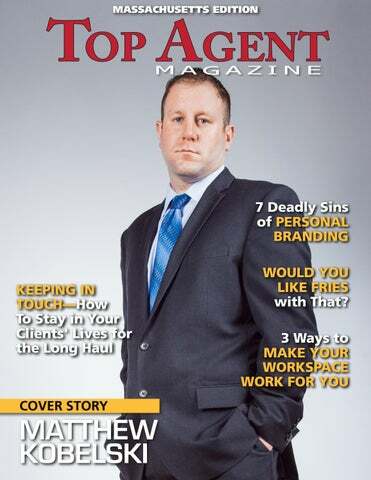 During his 12 years in the industry as a real estate attorney, broker and agent, Matthew Kobelski has closed upwards of 3,000 transactions. For that reason, each member of Matt’s team, he says, is committed to redefining personal service in real estate. To learn more about Matthew Kobelski, visit mattkobe.com or credentialsrealestate.com, email Mattkobe@CreLegal.com or call 617.938.3407, ext. 3 www.